This is not the usual diver, but it has the lovely look of one. In fact this is one of the first “divers” made by Citizen, the precursor of the famous Citizen real diving watches. It is the Parawater model but it has no specific depth rating. The production date of this particular watch is February 1970. The case is made in stainless steel, thin, with a bidirectional friction type stainless steel rotating bezel. It measures 38mm wide. It has a domed acrylic crystal that gives a lovely look to the black, matte dial. The crown is marked “C” as most of the early Citizen watches did and it is not screw type. The dial is simple, black, with luminous squares as hour markers. At three a clock it has the day-date window. Sundays , as usual, are written in red. The hands are common to Seven Star range at the era. The second hand has a luminous dot at the tip. 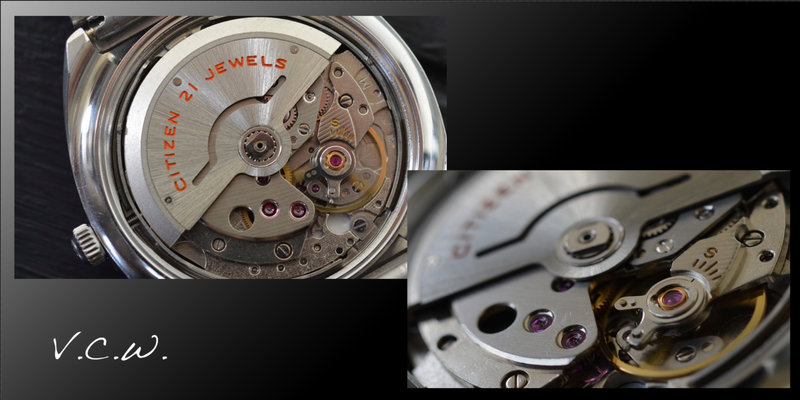 The movement is the the calibre 5204 with 21 jewels. It runs at 28,000 bph and it doesn’t hack. The date changes in the second position of the winding crown and the day changes by advancing the hands pass midnight. The bracelet is made in stainless steel, but I doubt the fact that is original to the watch. It fits the watch really nice. The clasp, is as usual, signed “Citizen”. Conclusion – Beautiful piece of history, a precursor of the real Citizen diving watches, the “missing” link between THE Parawater watch and the real diving watches made by Citizen.